CallEngine’s Tough Mudder team wearing custom t-shirts that read, “I sacrifice this shirt to the mud” after completing the 8 kilometre challenge. 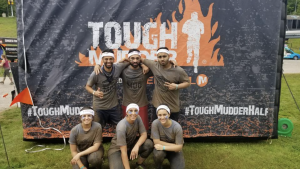 On August 19, CallEngine cheered on a team of individuals who had decided to take on a Tough Mudder challenge in Mount Saint Louis, Ontario. The purpose of a Tough Mudder event is to push individuals to their mental and physical limits through a series of challenging obstacles. Teams must work together to overcome mud-drenched obstacles and 15’ walls with a slippery incline. At this year’s event, the team took on an 8 km run with 13 obstacles. For CallEngine, sponsoring this team was an opportunity to support a good cause and members of the community. While Tough Mudder provides challenging mental and physical obstacles, the organization also encourages participants to fundraise for their official charity partner as well as different charities of their choice. Tough Mudder has teamed up with Team Rubicon, a non-profit disaster response organization which helps communities that have been affected by natural disasters. The organization operates through the help of military veterans to rebuild these communities. So far, Tough Mudder has raised more than $10 million dollars for different charities.